Governor Andrew M. Cuomo today announced a $1.2 million state challenge grant to construct a building to house the nearly century-old DeAngelis Carousel at Canalside in Buffalo. This year, Canalside welcomed 1.5 million visitors -- six times the population of Buffalo and ten times more visitors than it saw in 2010. On the heels of that record-breaking achievement, the installation of the vintage carousel complements the rapid transformation of Buffalo's waterfront. The new building will enclose the historic, custom-designed wooden carousel to allow for year-round access, provide space for events and activities, and showcase Buffalo’s rich history in carousel making and its vibrant waterfront. Highlighting the success of Outer Harbor, the Governor also toured the latest enhancements to the award-winning Buffalo Harbor State Park, surveying the completion of the new pedestrian promenade and the next phase of improvements already underway. "Buffalo's thriving waterfront is a driving force behind Western New York's resurgence, and the addition of this historic carousel will attract even more visitors and revenue to the region," Governor Cuomo said. "This new attraction showcases Western New York's rich history of carousel making as well as the region's growing leadership in sustainability. With over 1.5 million visitors at Canalside this year alone, the revitalized Buffalo waterfront is bolstering economic growth and helping us build a better, stronger Buffalo for generations to come." View the Governor's presentation on Buffalo's Waterfront here. The vintage menagerie, park-style carousel was manufactured in 1924 by Spillman Engineering in North Tonawanda. Buffalo Heritage Carousel acquired the DeAngelis Carousel to provide family oriented recreation on Buffalo’s waterfront and to celebrate Western New York's industrial heritage and legacy of leadership in renewable energy. Buffalo Heritage Carousel will continue to raise up to $2.8 million in funds to both power and preserve the carousel year-round at Canalside. The carousel is predicted to begin operations in the next two years and the price of admission will be set at a maximum of $1. This new attraction showcases Western New York's rich history of carousel making as well as the region's growing leadership in sustainability. The carousel complements the success of Buffalo's waterfront and recent developments, including the City of Buffalo’s first state park, Buffalo Harbor State Park. The $3.76 million project to improve the breakwall and southern revetment is part of the $15 million in improvements provided through the Governor‘s NY Parks 2020 initiative that is completely reinvigorating the Buffalo Harbor waterfront. The rehabilitated breakwall is stabilized and provides new recreational access with paved walking and bike paths, shaded seating areas, the introduction of a fishing platform and enhanced lighting for nighttime safety and enjoyment. The next phase of improvements at Buffalo Harbor State Park is underway, which includes a public boat launch, expansion of utilities, a redesigned vehicular roadway and parking to improve traffic flow for park users and boaters. Laurie Hauer-LaDuca, President of Buffalo Heritage Carousel, Inc., said, "It is so exciting that the carousel will be ready for riding within two years and Governor Cuomo has today taken our project a major step forward with his outstanding support of our carousel project. It is the BHC mission to make history come to life now as well for future generations. Grandparents, parents and children can make new memories together while riding the Carousel." Erie Canal Harbor Development Corporation Chairman Robert Gioia said, "With this funding we are headed in the right direction so that within the next two years families will have even more of a reason to visit and stay longer at Canalside, taking a ride on the carousel and spending time at the future Explore & More Children’s Museum." Mayor Byron Brown said, "Once it returns home to Buffalo, the historic Carousel will bring a unique entertainment opportunity to city residents and visitors. This funding guarantees that we will have the Buffalo Heritage Carousel up and running on our waterfront. This attraction will bring thousands of new visitors to downtown Buffalo and Canalside. Earlier this year, I authorized the sale of a city owned parcel at Canalside to Empire State Development to ensure that the historic Carousel would become a major attraction on our waterfront. 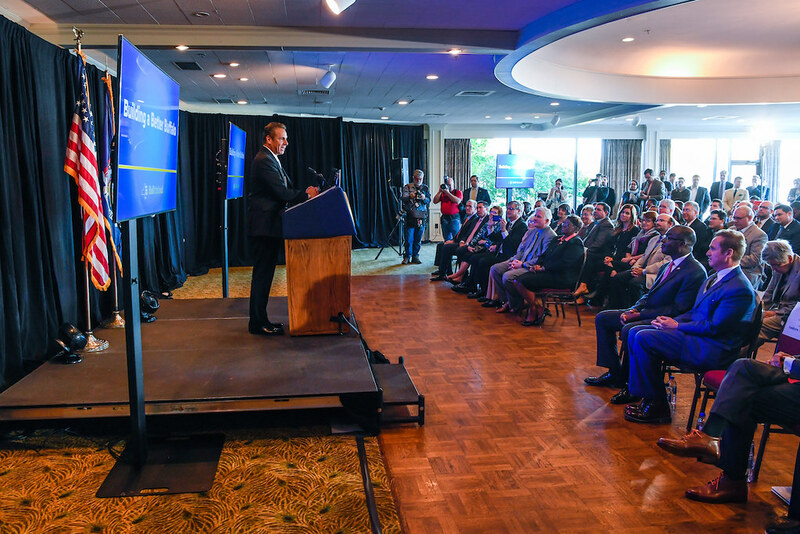 I'm pleased to see this project move forward and I thank Governor Cuomo for his continued dedication to the fortification of the Buffalo economy." Buffalo Heritage Carousel, the City of Buffalo and Erie Canal Harbor Development Corporation announced in June that a memorandum of understanding had been reached between these three entities to provide a future location for the carousel at Canalside. In accordance with this MOU, Erie Canal Harbor Development Corporation purchased property to provide a place to construct and operate the carousel project. Buffalo Heritage Carousel, Inc. was formed as a 501c3 non-profit organization to bring a solar-powered carousel to our revitalized urban waterfront, one that celebrates the history of carousel manufacturing in Western New York, the Erie Canal and the legacy of leadership in the use of renewable energy. The mission of Buffalo Heritage Carousel, Inc. is to provide entertainment and education about renewable energy technologies in a way that stimulates life-long learning about our environment and the responsible use of our natural resources.